Two incremental but important changes – wider seats and redesigned bins – have been announced for Boeing’s new 737 MAX, which will take to the skies in 2017. This isn’t just about passenger comfort, either. The changes are also intended to make flying a lot more affordable. At the heart of the 737 MAX project is a promise to reduce the cost-per-seat by 8 per cent, a saving that Boeing claims will give it the lowest operating costs of any single-aisle airplane. What’s more impressive is that it’s mostly design decisions, which are being made with the goal to reduce the airplane’s weight and therefore the amount of fuel it uses —which is where the money is saved but is also good for obvious environmental reasons, too. Boeing’s philosophy for the 737 MAX is smart business as well. 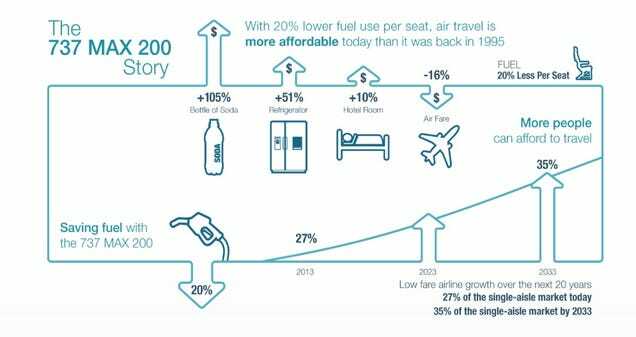 Spending less on fuel will help carriers pass along savings to passengers, which will in turn bolster the airline industry – meaning everyone will need to buy more planes. The cost-per-seat method is good maths but it also particularly helps one sector of the industry: the low-fare airline market, which the 737 MAX was specifically designed for. At the Aircraft Interiors Expo in Hamburg, Germany, this week, Boeing reps discussed two of the biggest changes being for US airlines Alaska and Southwest, which will actually roll out separately on other versions of the 737 before 2017. Perhaps the biggest news is a new overhead bin design (above) that will hold 50 per cent more bags. Yes, 50 per cent! A small vertical expansion of the bin now allows bags to be placed on their sides, which means six bags can fit sideways where only four fit flat. According to Wired the new size rebalances the bins which will actually make them easier to swing down. When the bin is open it also sits two inches lower in the cabin, making it easier for everyone to reach. But in a partnership with Southwest (which gets the first batch of 737 MAX planes), seats will be widened to 17.8 inches wide, compared to 17 inches now. According to Bloomberg, the new seats have an adjustable headrest that raises vertically and a storage space on top of the seat back. In addition to giving passengers a little teeny bit more room, the change is estimated to cut 91kg from each plane.